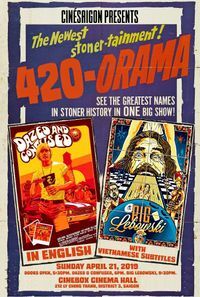 CinéSaigon presents: 4:20 Weekend Double Feature! CinéSaigon is back and better than ever! Join our 4:20 Weekend Double Feature, with coming-of-age favourite DAZED & CONFUSED (1993), paired with crime-comedy classic THE BIG LEBOWSKI (1998). Screened once again at CINEBOX, a retro cinema in District 3, we've got an entire floor for the event, with a spacious concession hall, theatre-like auditorium, plush seating and an epic big-screen for over 120 people. Stay tuned for themed F&B vendors, including munchies, edibles and more! SPECIAL PRICE: VND150k for both movies! Tickets on-the-door and in advance. Online ticket sales coming soon!